Home > Korg Zero 8 Live Control Console - Free Shipping! Korg Zero 8 Live Control Console - Free Shipping! Music is created in a dynamic process, where the artist works in a fluid fashion following their inspiration freely. The tools of the stage/studio have become more like instruments, to be played and manipulated in realtime as part of this creative process. Mixing, control, and effects all are part of the performance, and all are at the core of this revolutionary new instrument. ZERO LIVE CONTROL MIXER --- you have just met the future. ZERO LIVE CONTROL MIXER is an all-in-one �core station� designed for live performance artists, remix producers, and serious computer musicians providing a digital mixer, audio I/O, MIDI controller, and effect processor all in a single unit. Each channel can be switched between sources such as a turntable, CD player, microphone, computer, instrument, MIDI controller, or MIDI controller + audio to implement a sophisticated live mixing setup with the simplicity of a FireWire connection. This gives you an incredibly powerful and flexible tool designed specifically for live performance and remix production. Two models are available: ZERO4 is a four-channel version designed for the needs of the modern DJ, and ZERO8 is an eight-channel version covering the needs of advanced laptop musicians, studio remixers and DJs requiring more channels. ZERO LIVE CONTROL MIXER delivers truly professional-spec audio. It supports 24-bit 48 kHz high-resolution audio as standard, and can support up to 24-bit 192 kHz audio that�s equivalent to DVD audio fidelity. Along with the digital domain, analog components such as the input/output circuitry and power supply have been designed with painstaking attention to high-quality sound. The internal �18 volt power supply design delivers plenty of headroom and excellent audio quality. The mic preamps are an ultra-low impedance design by Peter Watts, a veteran designer of numerous professional mixers throughout his tenure at the Trident Corporation in the UK and as chief designer and vice president for product development at Mackie Designs in the USA. Finally, the power supply is a universal design that does not require an AC adapter, ensuring that the world-traveling professional can get to work immediately, assured of the highest level of performance. The EQ Selector is a completely new idea, providing an EQ section with eleven different simulation types. They cover needs ranging from corrective equalization to boldly creative sound-shaping, giving you a variety of EQ responses and curves, filter characteristics, and even isolator modeling that can be switched independently for each channel as needed. The stereo eight-channel ZERO8 provides an amazing eight units (independent for each channel). ZERO LIVE CONTROL MIXER contains a FireWire interface that lets you process and mix audio sources digitally, at the same time as performing MIDI control. 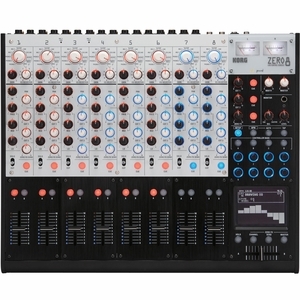 Since ZERO LIVE CONTROL MIXER contains everything else you need (audio interface, mixer, effect processor, MIDI controller), setup is simple, making it an extremely convenient choice for the mobile computer-based professional. One particular advantage of the ZERO series is its powerful effect system. On the stereo eight-channel ZERO8, there�s one Insert effect, one Send effect, and one Master effect. For the Insert effects you can choose from eight effect types, and for the Send/Master effects you can choose from eleven effect types, meeting the demands of any live mix. The stereo eight-channel ZERO8 uses its touch display as a realtime effect controller like the KAOSS PAD. You can manipulate a variety of effects while watching the graphics on the display, giving you an entirely new sense of control. This touch display can also be used to control MIDI and other settings simply by touching them, making it very easy to edit the settings. By using the dedicated "ZERO Edit" software you can freely assign MIDI messages to the faders, knobs, push-type encoders, buttons, toggle switches, and X-Y pad. The ZERO4 and ZERO8 are amongst a small group of mixers/control surfaces with digital audio interfaces that are Certified Traktor� Scratch ready. By adding Native Instrument's Traktor� Scratch software to your Zero rig, you�re instantly able to scratch and mix any digital media on your desktop computer or laptop using your existing turntable or CD deck setup with the specially coded CD�s and records! Also included is Ableton Live 6 Korg Edition. Live 6 Korg Edition allows you to construct music intuitively and in real-time with the ZERO mixer. Additionally, the Live Lite 6 Korg Edition offers audio/MIDI recording and many editing functions. Just a few of the possibilities and advantages of this integration of products include: easily assigning software tracks to hardware I/O and channel strips and tweaking plug-in parameters as well as accessing Live control mappings with the press of a button. 13 plug-in effect processors and two virtual instruments are offered for the audio/MIDI tracks, and you can use additional VST/AudioUnits plug-in effects/virtual instruments as well. Of course you can freely operate the mixer and transport controls from the ZERO, and you can also tweak all of the virtual devices parameters. The software even includes some lessons in the Help Mode to get you started using the controllers and built-in synth! Live Lite 6 Korg Edition offers many of the new features found in Live 6, including Multicore/Multiprocessor Support, Instrument and Effect Racks presets, Macro Controls, Project Management tools and a variety of new devices including EQ Eight, MIDI Note Length, Dynamic Tube and an improved Saturator device.